Basically, accented characters (á, é, etc.) and other symbols get replaced by multiple symbols only on iOs mail app. Gmail works fine. The only way around it is to manually replace á, é, etc. with their entities (&aacute;, &eacute;, etc.). 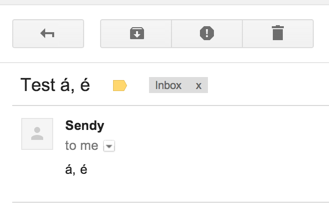 UTF8 meta tags are correctly specified in the HTML, so the problem is likely that Sendy is missing a certain encoding header when sending e-mails. Is this possible? It's good practice to use HTML entities instead of the resulting characters directly. It's the best way to ensure they'll work on any email clients (or browser). I know, but in this case it seems to be because of the headers Sendy sends, might be a bug that can be solved. 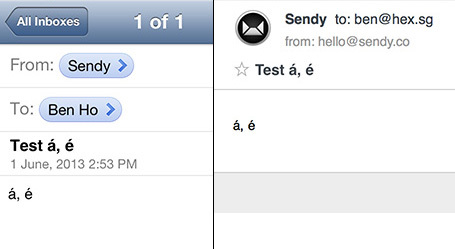 Yup, as I said Gmail works perfectly, but it's iOs that shows garbled symbols (iPhone's and iPad's mail app). My $charset in '/includes/config.php' is set to utf8. If you use chinese characters, try using utf16.